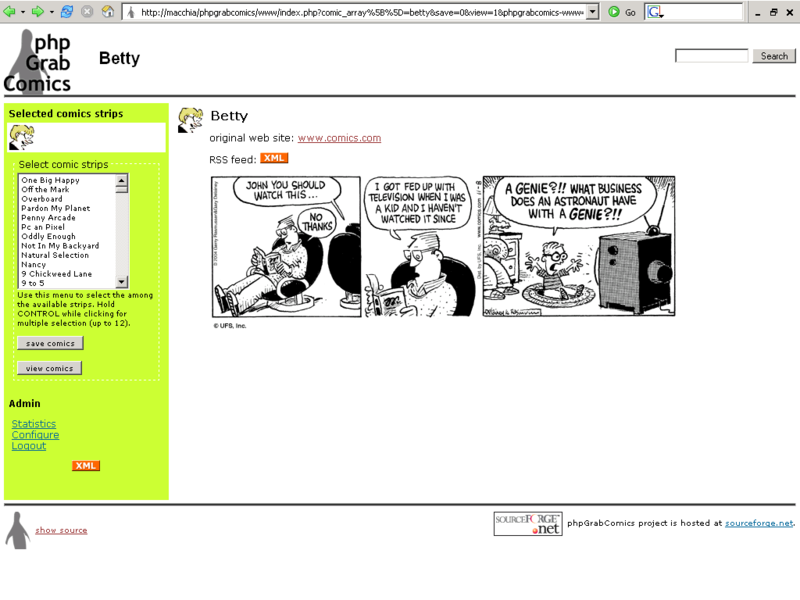 The GNU phpGrabComics server (download from here) allows to download comics strips from the internet and to provide to phpGrabComics clients information on how to download the strips. It is written in PHP and uses MySQL as database. No other database technologies are supported at the moment, and no specific request as been made in that direction. phpGrabComics includes PEAR classes. jpcache is used as caching system. phpGrabComics is optimised for use on Unix-like systems (as GNU/Linux and BSD) and for the Apache web server. It will work without any problems on Microsoft Windows, or on other web servers supporting PHP, but some (few) features might not be available. The phpGrabComics server exports information about the strips in XML. phpGrabComics clients can connect to a phpGrabComics server and collect the information for downloading the comics. phpGrabComics server web pages are compliant to XHTML 1.0 strict and CSS 1/CSS 2 standards, and to WAI Priority 1 checkpoints. You can find here a list of web sites using the phpGrabComics server. The following screenshots show the main features of the phpGrabComics server that are for administrators only (screenshots are based on phpGrabComics 1.3). 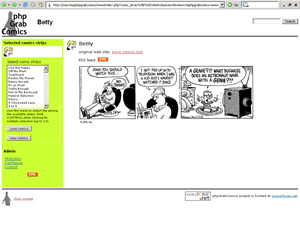 When logged in and browsing the phpGrabComics site, the administrator will see not the miniature of the daily comic, but a local copy of the daily comics itself. This allows the administrator of a phpGrabComics web site to see even comics that have HTTP protections and cannot normally be seen without viewing the web site itself. Normal users cannot access the original comic strip. phpGrabComics server will, by default, download daily all the comics, but will not keep copies of the comics. The administrator can choose the comics that will be archived. Archive your comics. You will never miss a single strip any more! 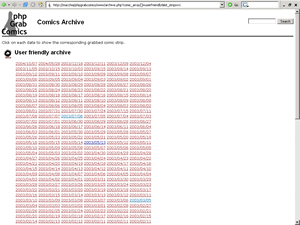 Archived comics can be accessed via the web interface. Clicking on the day will show the daily comic for that date. Of course, you can even download your comics and store them in your computer for easier reading.